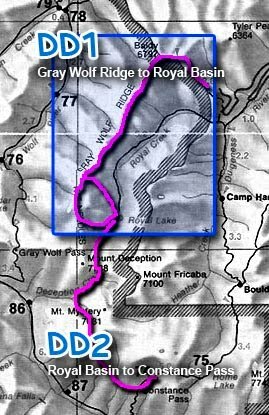 This route is about 8 miles off trail; it has been done in one long day from the road, returning from Royal Basin by trail 7 miles back to the same trailhead for a 15-mile loop. On the south end, this traverse can be linked with DD2 (Royal Basin to Constance Pass). See the published Climbers Guide for detailed approach information. From Baldy, traverse S at the 6000- to 7000-ft. level in meadow, scree, or snow, all the way to The Needles. Stay on the ridge crest most of the way. Peak 7076 can be climbed by way of a basin between the double summit to avoid a broken ridge. Once past Peak 7076, the next summit is in The Needles and requires technical climbing. To continue to Royal Basin, descend SE over steep broken slopes and chutes to the Royal Basin trail below the basin. An alternate, but difficult, route from the ridge top is to work W around Mt. Walkinshaw by way of a basin N of the peak, then climb to the NW ridge of Mt. Walkinshaw at about 6750 ft. From here, drop to the valley W of The Needles. Continue up this valley, which leads into Surprise Pass just SW of Mt. Clark. The climb to the pass is up steep snow or ice, requiring mountaineering skill and equipment. From Surprise Pass, drop into open, snowy Surprise Basin and continue on easy terrain for 1 mile to Royal Lake.